Settling pond at the Dundee Road Constructed Wetlands system. 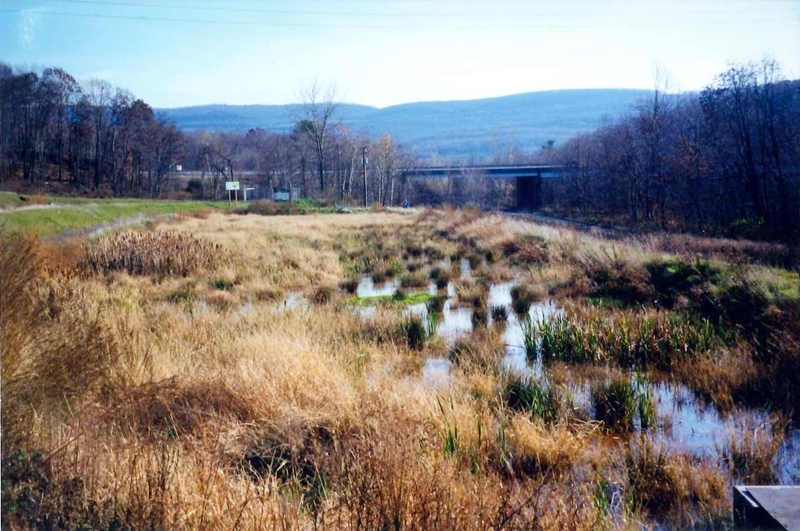 Dundee Wetlands was Earth Conservancy’s second constructed wetlands system, the first having been built in 1996 along Espy Run. 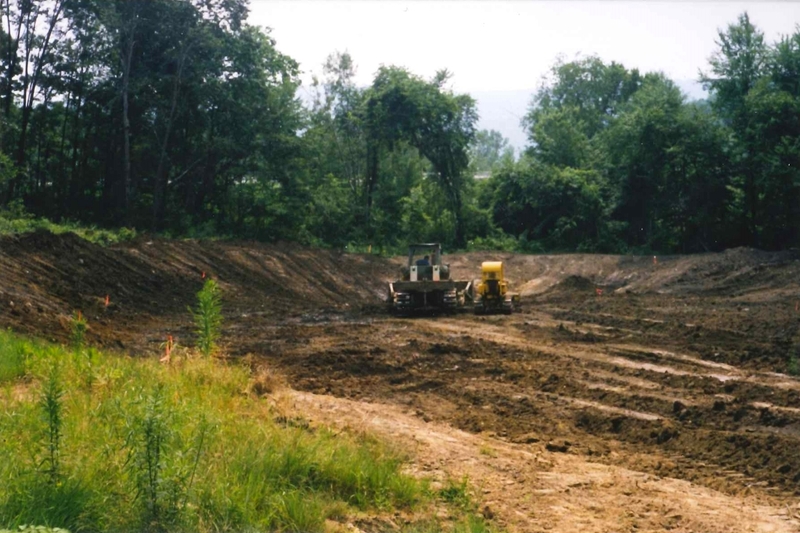 Although a small pond, the ability of the constructed wetlands to treat AMD was significant. EC consequently sought to build a larger facility to address another pressing problem: the AMD gushing from the Askam Borehole. Drilled in 1973, the borehole helped relieve water pressure in underground mine pools. Unfortunately, it also expelled large amounts of AMD into the Nanticoke Creek. 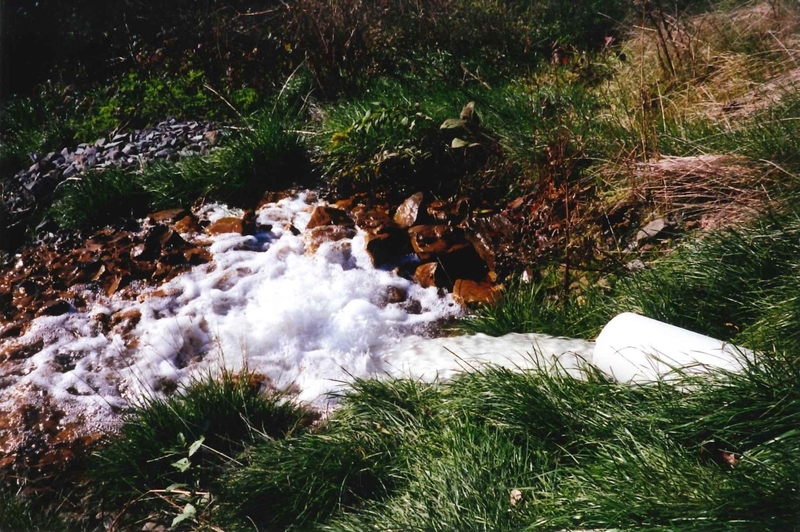 At peak flow, approximately 7,000 gallons of AMD-polluted water were released per minute. The Dundee Road Constructed Wetlands was built in 1999. The 2.2-acre system was comprised of two cells: a treatment cell, and a polishing cell. First, water exiting the borehole was pumped uphill, through a pipe and then a culvert, into the treatment cell. In it, the natural settling of iron particles could occur. 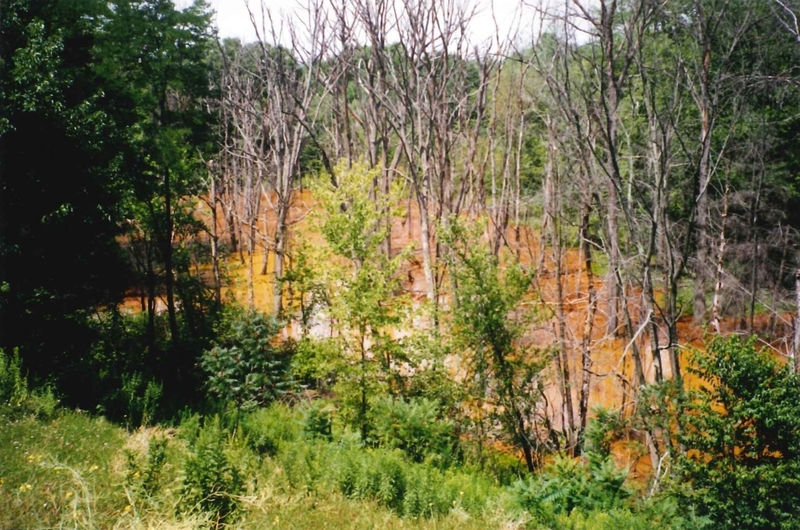 The water then flowed into the polishing cell where the roots of wetland plants would trap remaining iron, before it exited back into Nanticoke Creek. Ultimately, the Dundee Wetlands was able to treat up to 500gpm of AMD, removing approximately 95% of the iron from the water. 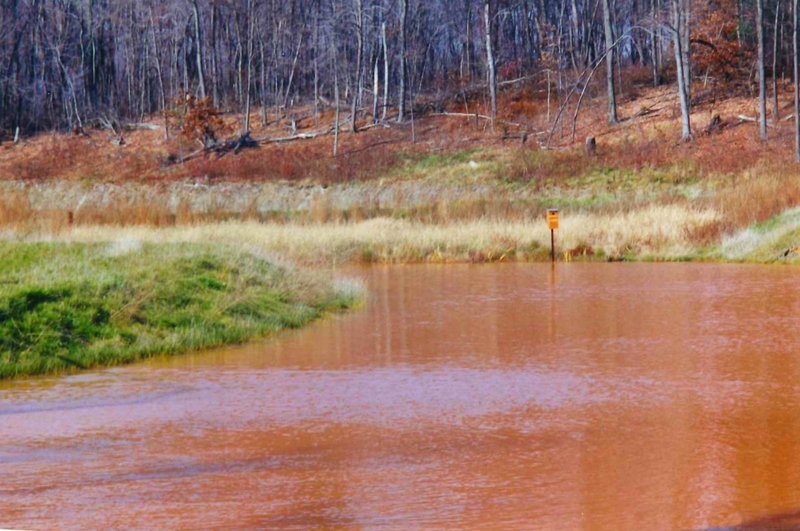 By comparison, the 1.2-mile waterway between the borehole and the pond was coated with thick, orange sludge. 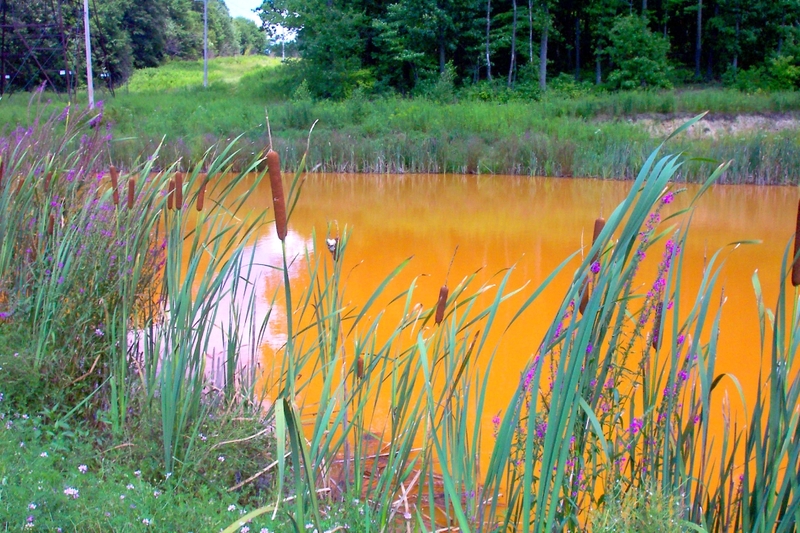 In 2008, the Askam Borehole collapsed – the acidity of the water had corroded its metal piping. Without a controlled outlet, water began to flood basements of nearby homes. 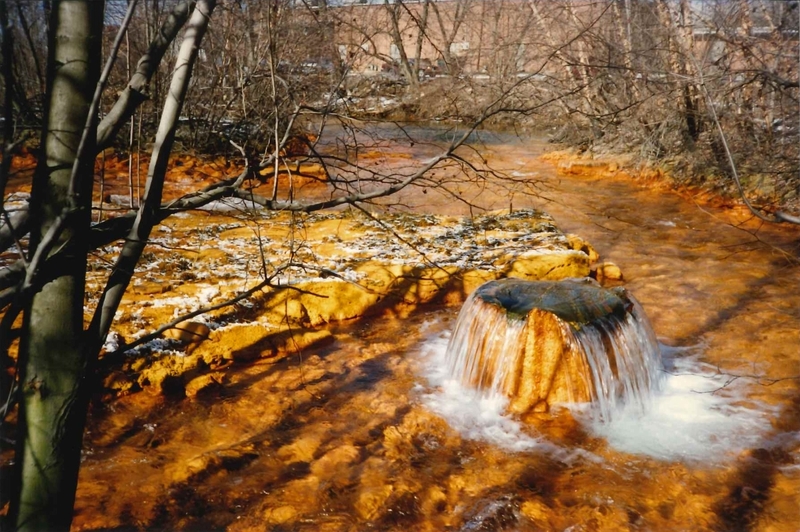 The U.S. Department of the Interior’s Office of Surface Mining was tasked with correcting the problem, drilling two new boreholes lined with stainless steel casing. Since they were across the road from the Dundee Road Wetlands, the facility went offline. In 2010, EC set up a pump in a nearby borehole to continue the water supply to the wetlands. In doing so, the wetland habitat was preserved and the site could be used for educational pursuits. To address the AMD from the newer boreholes, EC constructed the Askam Borehole AMD Treatment System in 2014. View from S.R. 29, the South Cross Valley Expressway, looking down on the AMD-contaminated water of the Nanticoke Creek. The original Askam borehole, prior to its collapse in 2010. 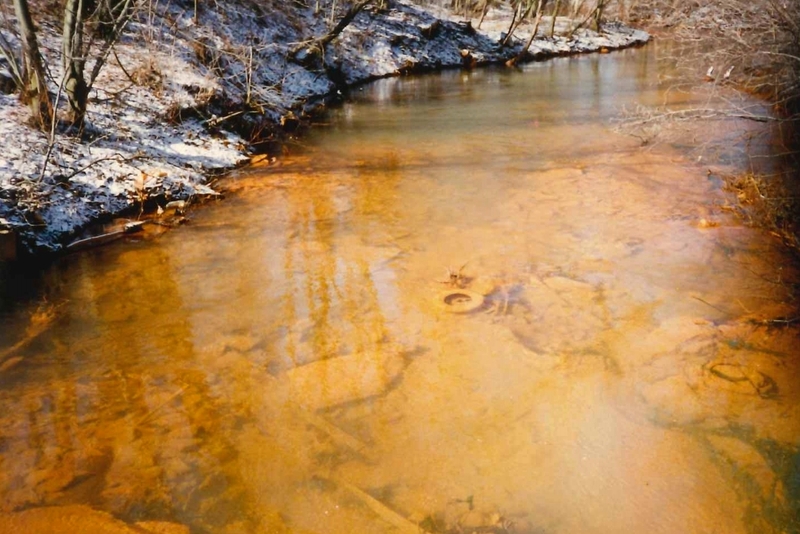 The extent of iron sedimentation from the AMD is clearly visible throughout the waterway. A closer look at the thick sludge produced by the AMD in the waterway below the Dundee site. Construction work on the basin for the Dundee Wetlands / Phase II site. 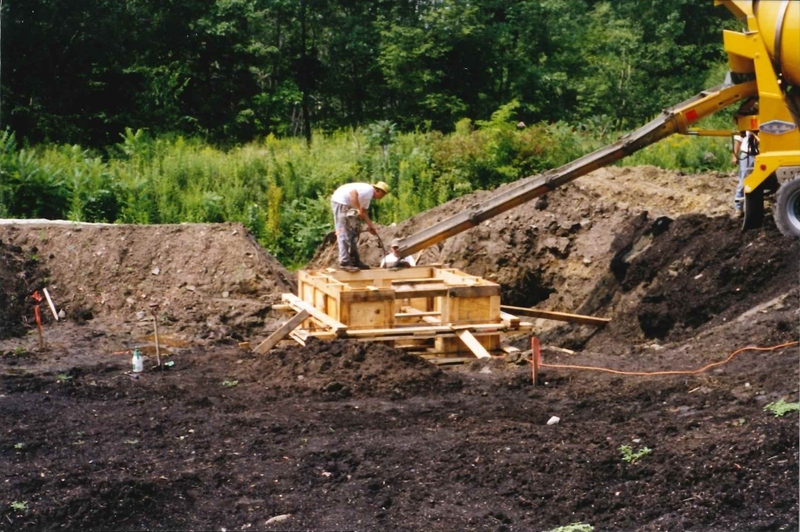 Concrete being poured into a mold for the outlet in the polishing cell of the Dundee Wetlands. 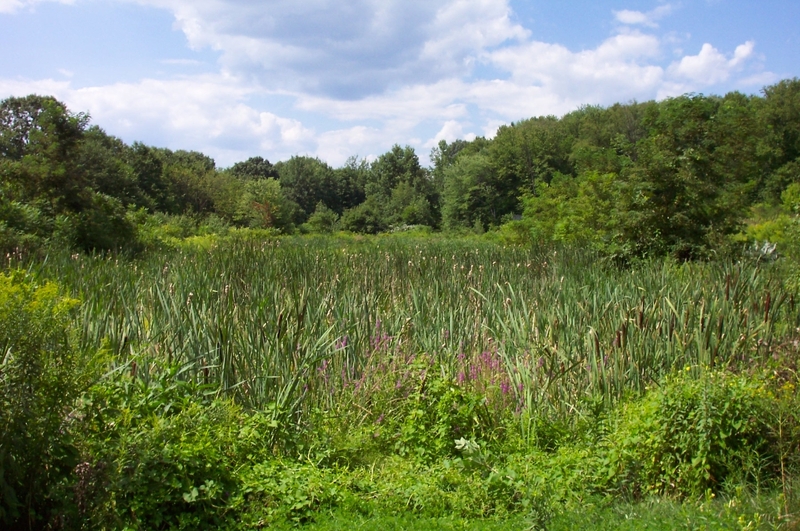 Image of part of settling pond at the completed wetlands. At the far edge can be seen a nesting box, intended for Wood Ducks. View looking across the completed wetlands, with S.R. 29 in the distance. Clean water exiting the Dundee Road Constructed Wetlands system. More recent image of the polishing cell at the Dundee Road wetlands. Although offline, the naturalization of the pond continues to improve habitat and increase wildlife.